THE SOUTHERN OCEAN, February 11, 2012 (ENS) – Beck Straussner, 42, of the United States was hit in the chest with a water cannon and knocked off his jet ski today during a confrontation between a Japanese whaling vessel and whale defenders near Antarctica. 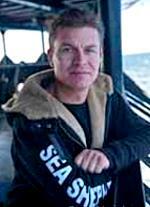 Straussner, from Maui, Hawaii, was in the Southern Ocean near Antarctica in his capacity as the 2nd Officer on the Sea Shepherd Conservation Society’s flagship vessel, the Steve Irwin. Captain Watson commands the Steve Irwin. This is the eighth consecutive year that he has taken ships to the Southern Ocean to fulfill his stated mission by exposing and confronting illegal activities on the high seas. Watson maintains that what the Japanese call “research” whaling, allowed by the International Whaling Commission, is, in fact, illegal. 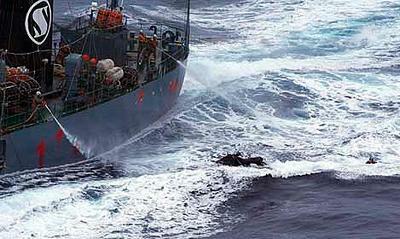 In a strategic battle at sea that began in December, the Japanese harpoon vessel Yushin Maru No. 2 had been tailing the whale defenders’ ship for weeks. 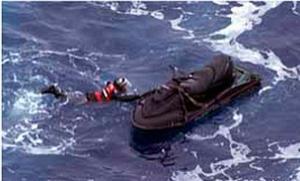 Today, at 1700 Hours Eastern Australia Standard Time, about 580 miles off Marie Byrd Land, Captain Watson deployed three inflatable boats and the jet ski to interfere with the tailing vessel. 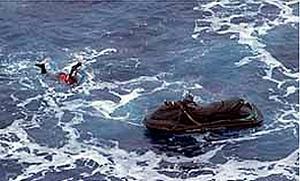 He says the maneuver was an attempt to force the Yushin Maru No. 2 to slow down and fall behind, allowing the Steve Irwin to escape. He says Straussner was knocked off his jet ski into subzero Antarctic waters when he was struck in the chest by one of the water cannons on the Japanese harpoon vessel. The Yushin Maru No. 2 did not stop to offer assistance. Straussner was able to swim to his jet ski and get underway again. He returned to the Steve Irwin some nine miles away. Speaking on behalf of the Japanese whalers, the Japanese Institute of Cetacean Research, ICR, issued a statement accusing the activists of “aiming to disable the Japanese vessel rudder and propeller” by deploying ropes “more than seven times” just in front of the Yushin Maru No. 2’s bow. The activists used an air gun to fire “several dozens of projectiles containing an irritant chemical” and “threw by hand several dozens of smoke bombs, butyric acid-containing glass bottles and paint-containing glass bottles toward the YS2,” the Institute said. The Japanese do not deny the Yushin Maru No. 2 made use of its water pump “as a preventive measure to make SS activists desist from further approaching,” and repeatedly broadcast a warning message. The Japanese vessel towed from its stern a rope with keep-your-distance-warning buoys in an attempt to keep the rubber boats from closing in, “but the rope was cut off by activists,” the ICR said. There were no injuries to the Japanese crew from this attack although some of the butyric acid and paint projectile bottles hit the Japanese vessel, and several ropes entangled in its propeller, said the ICR. This is not the only time this season that Sea Shepherd crew members have been injured by the Japanese whalers. On January 18, grappling hooks thrown by Japanese crew on the Yushin Maru No. 2 injured several Sea Shepherd volunteers on an inflatable they were using to confront the whaler. While the Japanese have given themselves an annual quota of more than 900 minke whales and 50 fin whales, the Nisshin Maru and one harpoon vessel have not had time to stop and kill whales as they remain on the move to avoid the two Sea Shepherd ships. The two harpoon vessels tailing the two Sea Shepherd ships keep the Nisshin Maru informed of the movements of the conservation ships, preventing the Sea Shepherd crews from closing in on the factory ship. Watson says his organization has proven that aggressive, non-violent intervention can be highly effective.